MONTREAL, QC--(Marketwired - October 31, 2016) - Falco Resources Ltd. (TSX VENTURE: FPC) ("Falco" or the "Company") is pleased to report three additional drill results from its 2016 exploration program at its 100% owned Horne 5 project located in Rouyn-Noranda, Québec. Additionally, the Company is pleased to report results from its 2016 regional exploration and prospection program. Luc Lessard, President and CEO, comments: "We are delighted with the initial result from the Quemont Extension Target, today's result demonstrates the potential to find additional mineralization near the Quemont shaft." The Quemont program targets the western plunge of the historical Quemont deposit, where over 3.2 million ounces of gold was produced from 1949 et 1971 (15.4 million tonnes at 6.5 g/t Au, 2.4% Zn, 1.3% Cu and 30.8 g/t Ag). 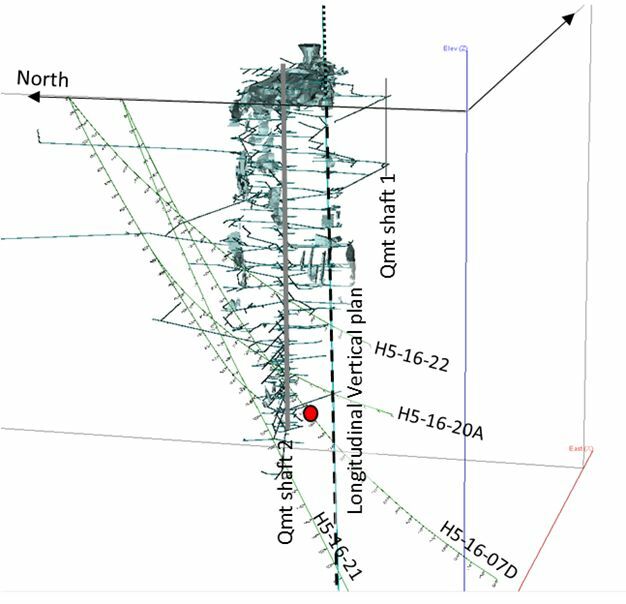 Hole H5-16-7D: The hole targeting the H5 mineralized zone, intersected the Quemont corridor at about 1,000 metres below surface. 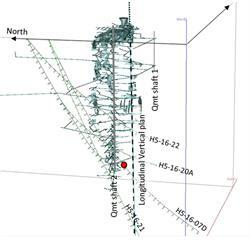 The mineralized zone was encountered in the western plunge of the Quemont shaft. A moderate Cl-Si rhyodacite containing 2% PyCp was noted. A mineralized zone was encountered between 1,171 metres and 1,181 metres and returned 10.02g/t of gold equivalent grade, including 9.31 g/t gold over 10 metres. Following the intersection, the hole was further deepened in order to intersect the Horne 5 mineralisation package. 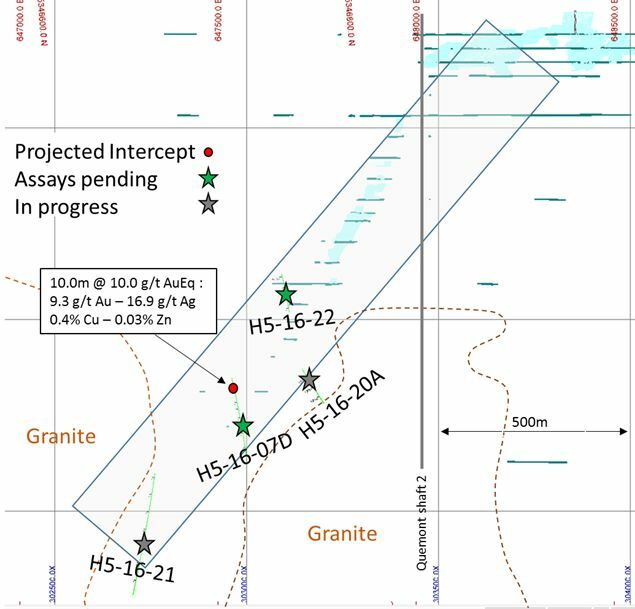 The interval which intersected the Horne 5 deposit will be used for additional metallurgical testing and assay results are pending. Details of Hole H5-16-7D are outlined in the table below. Holes H5-16-20A & 21 are in progress. 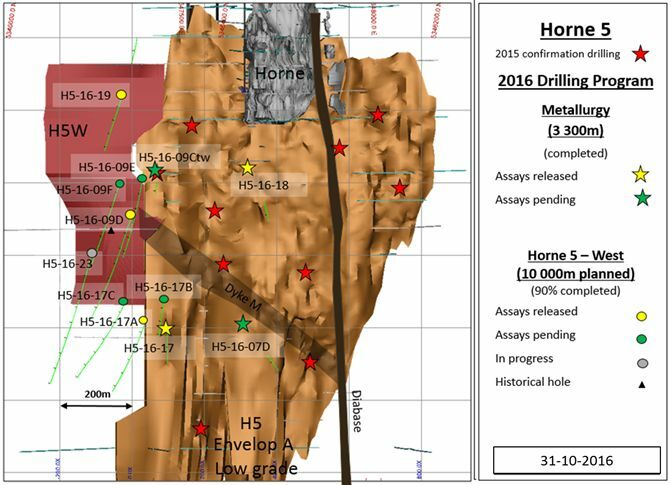 Hole H5-16-22 was completed and logged, assay results are pending. Two additional holes were completed on the Horne 5 Western Extension ("H5W"). The drilling program was initiated to test potential mineralization located west of the currently defined Horne 5 deposit. Hole H5-16-09-D and Hole H5-16-19 confirm a possible displacement of the mineralization to the south. H5-16-09D: The mineralized zone, expected at about 1,250 metres, was not encountered but structures, sub-parallel to the hole (NE-SW), were noted. 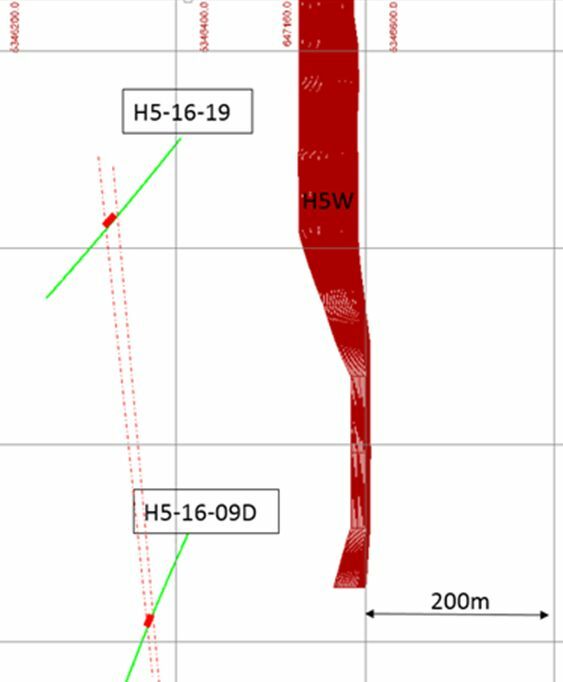 Originally planned for 1,300 metres, the hole was continued hoping to intersect the zone deeper and also test the Horne felsic package. The mineralization was encountered at 1,647 metres. The mineralization appears to have been displaced approximately 200 metres south. H5-16-19: This hole targeted the upper part of H5W. The hole ended at 1,416 metres. 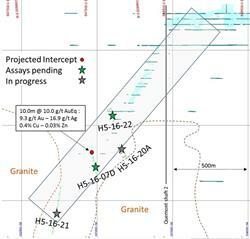 The mineralization, corresponding to the H5W extension, was expected around 980m but no significant zone was observed. However, a massive rhyolite containing 5-15% disseminated Py and stringers was noted from 1,307 to 1,340 metres. A displacement of the mineralization to the south is expected, as observed in Hole H5-16-09D. Holes 17C, 09E, 09F have been completed and logged. Assay results for holes are pending. Gold equivalent calculations are based on the following assumptions: metal prices of (all $US): gold $1,300/oz, copper $2.15/lb, zinc $1.00/lb, silver $18.50/oz. The results are presented uncapped. True widths are not known at this time. * Information regarding Holes H5-16-17 and H5-16-18 were incorrectly released in the September 13, 2016. See comments in table. The corrected and revised data was included in this release. The gold equivalent grades have been adjusted to reflect the new commodity price assumptions used in the latest mineral resource published by the Company on October 3rd, 2016. See www.SEDAR.com. The Company continues to be active in the Rouyn-Noranda mining camp, with the completion of a diversified exploration program including prospection, trenching, sampling, mapping, surface geophysical surveys and drilling. Drilling occurred on 4 different regional properties, located in a ray of 25 kilometers around the city of Rouyn-Noranda. The Company completed 5 holes and a total of 1,904 meters. The Lac Joannes property is a Greenfield gold exploration project and consists of 31 claims covering an area of 839.99 ha. It is 100% owned by Falco. The geology of the property is characterized by the contact between the sediments of the Cadillac Group and the volcanic rocks of the Blake River Group. The property is located 2 kilometres Est of the Hosco and Heva deposits (Hecla Mining) and its southern limit is crosscut by the Cadillac Larder-Lake Fault. Gold mineralization in Hole 17932-16-01, is associated with fine quartz veins crosscutting the sediments. The Ruisseau Davidson property is a Greenfield gold and base metals exploration project. It consists of 20 claims covering an area of 597.08 ha. It is 100% owned by Falco. The property is mainly underlain by the volcanic rocks of the Blake River Group. The Davidson Creek separates these volcanic units from the Cadillac Group sediments. Native gold mineralization in Hole 17912-16-01, is observed within a series of late smoky quartz veins. A follow-up of the best targets will be pursued in 2017. Claude Bernier, Exploration Manager, (P.Geo. P.Eng.) is the qualified person for this release as defined by National Instrument 43-101 -- Standards of Disclosure for Mineral Projects and has reviewed and verified the technical information contained herein. Mr. Bernier is an employee of Falco and is non-independent. Falco has implemented a strict quality-control program to comply with best practices in the sampling and analysis of drill core. As part of its QA/QC program, Falco inserts certified external mineralized standards. In the mineralized zones, each shipment is comprised of 20 samples. Every shipment is composed of 17 samples, a standard, a blank, and a reject duplicate to test the laboratory analysis methods and precision for each shipment of samples. Blanks and standards are inserted within the normal sample number sequence, while the duplicate is asked at the end of a batch. Assay results and certificates of analysis are interpreted and reported on a regular basis. If anomalies are detected, the laboratory is advised and the entire batch of samples is re-assayed. In non-mineralized zones, every shipment is composed of 20 samples, which includes a standard and a blank. In non-mineralized zones, if anomalies are detected, the laboratory is advised, but the batch of samples is not necessarily re-assayed. Falco Resources Ltd. is one of the largest mineral claim holders in the Province of Québec, with extensive land holdings in the Abitibi Greenstone Belt. Falco owns 74,000 hectares of land in the Rouyn-Noranda mining camp, which represents 70% of the entire camp and includes 13 former gold and base metal mine sites. Falco's principal property is the Horne Mine, which was operated by Noranda from 1927 to 1976 and produced 11.6 million ounces of gold and 2.5 billion pounds of copper. Osisko Gold Royalties is the largest shareholder of the Company and currently owns 16.2% of the outstanding shares of the Company. This news release contains forward-looking statements and forward-looking information (together, "forward-looking statements") within the meaning of applicable securities laws and the United States Private Securities Litigation Reform Act of 1995. All statements, other than statements of historical facts, are forward-looking statements. Generally, forward-looking statements can be identified by the use of terminology such as "plans", "expects", "estimates", "intends", "anticipates", "believes" or variations of such words, or statements that certain actions, events or results "may", "could", "would", "might", "will be taken", "occur" or "be achieved" and includes, without limitation, achievement of objectives set for the drilling program on the Horne 5 property and the regional exploration properties. Forward-looking statements involve risks, uncertainties and other factors that could cause actual results, performance, prospects and opportunities to differ materially from those expressed or implied by such forward-looking statements. Factors that could cause actual results to differ materially from these forward-looking statements include the reliability of the historical data referenced in this press release and those risks set out in Falco's public documents, including in each management discussion and analysis, filed on SEDAR at www.sedar.com. Although Falco believes that the assumptions and factors used in preparing the forward-looking statements are reasonable, undue reliance should not be placed on these statements, which only apply as of the date of this news release, and no assurance can be given that such events will occur in the disclosed times frames or at all. Except where required by applicable law, Falco disclaims any intention or obligation to update or revise any forward-looking statement, whether as a result of new information, future events or otherwise.